KarmaFX Synth Modular 0.95b and KarmaFX Plugin Pack 1.9 released ! KarmaFX Synth has now been placed in its own installer. Full list of changes below. KarmaFX Synth Modular 0.95b BETA changes. Added multi-sample support to sampler with simple Soundfont/SF2 import. Replaced scale knob in Sampler with sample index knob for selecting (multi)-samples + Added sustain support with draggable start and end position-markers. + Added key/velocity range editor for changing sample ranges and root-key. + Added "sample trigger" led that auto-triggers sample when sample index changes. To avoid overflow and/or machine crash or speaker damage, modules now detect very high volume-levels and self-disable with an "overflow!" warning. Rewrote the Chorus, added feedback filter, and reworked its interface, so it's possible to crank out thick chorus as well as flanger style effects. Added two-channel stereo Mixer to the Amplifier section. Added "Panorama" option to Amplifier, that samples the current pan- position on key trigger. Added keyboard tracking to Comb and Allpass filters, and increased their frequency range, so they can be used for physical modeling. Increased max number of automation controls from 32 to 128. However, still only the first 32 are accessible from the control panel. Added simple (delay-based) pitchshift module to Effects. Improved Sampler's ramping between samples when changing position/sample. Changing loop mode in sampler now instantly changes play direction. GUI: Increased size of Step and Envelope modules. GUI: To avoid ghost trails modules are forced to update on window redraw. GUI: Added "Clone" and "Replace" options to right click on module menu. GUI: Added "Bank Select" submenu to right click on background menu. GUI: Added option to create a "New Bank" to right click menu. GUI: Added "Antiphase" and "Negative feedback" options to Phaser. GUI: Reordered right-click menu on definable knobs in controls panel. GUI: Added "Shuffle" and "Flip" buttons to step sequencer. GUI: Better zooming in Sampler by dragging mouse up/down in sample-display. GUI: Added "ramp" option to Sampler that toggles sample ramping/crossfade. GUI: Sample browse up/down buttons now browse multi samples. To do disk sample browsing press and hold shift, then click on the arrows. GUI: Reorder New Patch/Store Patch in right-click menu for consistency. GUI: Added Show/Hide Modulation options to right click option menu. GUI: Added Rename option to right-click menu in sampler's sample-display. GUI: Added simple sample selection (shift+drag) and Cut, Crop, Silence, Fade In/Out and Reverse functionality to sampler's sample-displays right-click menu. Bugfix: Freq snap didn't work correctly in 4 and 8 octave mode. Fixed. Bugfix: Infinite loop check caused crash when changing input from menu.Fixed. Bugfix: A sometimes hanging position marker in GUI was fixed. Bugfix: Delay's Pingpong knob was inverted. Fixed. Bugfix: Zolzer lowpass would sometimes not work after disabling module. Fixed. Bugfix: Possibly removed Windows ME memleak in Step and EQ31 modules(?). Bugfix: ADSR Decay and Release was too long in Exp mode. Fixed. Bugfix: Allpass filter zipper-noise bugfix. Bugfix: Fixed patch corruption when using more than 256 char description. Bugfix: Recoded Zolzer's bandpass and notch filters. Bugfix: Cutting a connection wire could make the synth crash! Fixed. Bugfix: A minor midi trigger/detrigger polyphonic bug fixed. Bugfix: Effect/Controller were incorrectly ordered in New Sampler-Template. Bugfix: Synth could crash when receiving too many simultaneous notes in mono mode. Reordered patches in categorized banks. There is now a Bass bank, a Drum bank a Lead bank, a Pad bank, and a SFX bank. Made a few new patches, and added a bunch kindly contributed by friendly users. Synth has been put in its own installer, to make room for patches, skins etc. Added more presets (Thanks Rick and Sink!) + Added more user preset slots. Display wasn't updated with reverb type on preset load. Fixed. 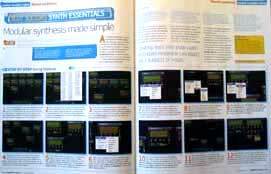 Once again, KarmaFX Synth Modular is used in Scot Solida's two-page Synth Essentials column. This time Scot experiments with Wavetable Synthesis. 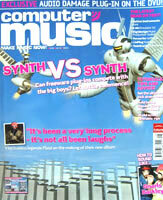 The KarmaFX Synth Modular is reviewed in this month Computer Music and compared to Reaktor, a 300£ commercial synth. It scores 8.6, where Reaktor scores 8.8. 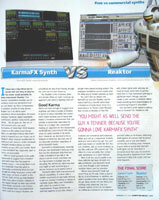 KarmaFX Synth is given 9 out of 10 in Ease of use, Sound quality and GUI; and 8 out of 10 in Flexibility and Features. Not bad for a beta. Available in Plugin pack 1.8. Full list of changes below. KarmaFX Synth Modular 0.94b BETA changes. Wiring two modules that produce an infinite loop, will now result in a warning giving the user a chance to cancel the operation. Added range and snap options to right click menu on freq. controls in Osc1, Osc2 and Sampler. Choose between 2,4 and 8 octave range, and optionally snap to cents, semitones and octaves. Default is 2 octaves, no snap. Tweaked keyb follow on filters. Setting keyb to 32 now means tracking 100% to incoming pitch, 64=200%, 0=no tracking, -64=-200% etc. (Thanks Jeroen). Bugfix: Fixed possible division by zero bug in Reverb. Improved performance of modulated LFO's. e.g. SAVIHost. Fixed (Thanks Hermann). Bugfix: Stupid bug had sneaked into v0.93 causing Formant filter to overflow and even crash on some systems. Fixed. Bugfix: Host GUI window was allowed to erase background leading to white squares in a few hosts. "Fixed" by subclassing the parent window. Bugfix: Wire modulation volumes weren't saved with the patch. Fixed. Bugfix: Numerical precision could lead to signal not reaching zero with amp modulation. Fixed (Thanks Matthew). Bugfix: The "Modules producing silence"-optimization resulted in sound-glitches in variable buffer size hosts. Fixed. Bugfix: Polyphony was broken in v0.93, especially for chords. Fixed. Bugfix: Legato trigger in adsr, envelope and step modules fixed. 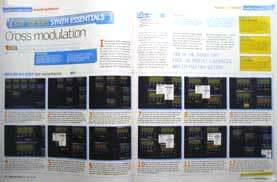 The KarmaFX Synth Modular is again used in Scot Solida's two-page Synth Essentials column. This time Scot experiments with Cross Modulation inspired by the Prophet 5. All plugins have been updated, and the KarmaFX Equalizer has been added to the pack. KarmaFX Synth Modular 0.93b BETA changes. Core sound engine optimizations + SSE optimizations enabled. Modules producing silence are now disabled internally to save CPU. Tweaked Moog filter - 8 pole version now works. Added multi-range 31 band graphic equalizer with adjustable gain and bandwith. Added aftertouch support to MidiData module (not tested). Added support for loading 24 bit int and 32 bit float .wav files. In non-trigger mode, modules now auto-trigger once to kickstart freerun. GUI: Replaced line wires with thick, shaded, antialiased wires, that can be drawn in 3 modes: linear (default), curved, and bouncy. GUI: Left pressing mouse on wire arrows will now bring up a volume/multiplier changer for patched signals. GUI: When Ctrl clicking on modules to connect a wire, the wire is now shown. GUI: Added skin switch support. No skins yet, but the functionality is there. GUI: Increased the horizontal size of the sampler. GUI: Added option to always start in "simplex" mode on startup. Bugfix: Fixed uninitialized data bug in one pole filter. Bugfix: Next-patch button would only go as far as patch 127, not 128. Fixed. Bugfix: First half-period of hardsynced Osc2 square was improperly inverted. Bugfix: Fixed potential crashbug when switching polyphony mode. Bugfix: In monophonic mode, holding two keys and relasing one now reverts to last note still pressed. Bugfix: Sampler normalize would sometimes peak detect incorrectly. Fixed. Bugfix: Rendering in non 44kHz could sometimes result in crackles. Fixed. Bugfix: Sampler's GUI position marker would sometimes wrap too soon. Fixed. Bugfix: Memtrash bug fixed in step sequencer. Bugfix: "Unlink control" would not unlink controls in unused modules. Fixed. Removed Bank2 and added a new Bass bank (still work in progress). Rescaled filtermode midi range. Notch filter is now in range 95-127 instead of strict 127. Added "mod" button to enable(=default) or disable delay modulation. 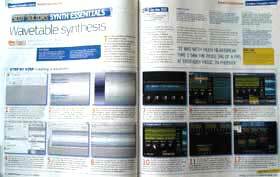 The KarmaFX Synth Modular is used in Scot Solida's two-page Synth Essentials column: "Modular synthesis made simple". Among other things, Scot shows how to setup a simple patch and modulate a filter's cutoff knob using an ADSR. Available in Plugin pack 1.6. Full list of changes to the synth is listed below. KarmaFX Synth Modular 0.92b BETA changes. Synth now supports more than 2048 samples latency. Instrument indices now start at 1 instead of 0. Added "freerun" mode for generators and modulators when Trigger not enabled. when host starts and detriggered when stopped. User controls can now be renamed. Added frequency info to comb filter. Added value knob and manual mode to MidiData module. Clicking on "Synth Modular" logo now switches to simplex GUI mode and back. Bugfix: Blue "collapse" button in Sampler had stopped working. Fixed. Bugfix: Peak filter gain in Parametric could go out of range. Fixed. Bugfix: Modulation wires are now updated when switching Parametric filter. Bugfix: Modulating Comb/Allpass filter parameters caused zipper noise. Fixed. Bugfix: Changing knobs in control panel did not update host parameters. Fixed. Bugfix: Patch count would not always go all the way up to 128. Fixed. Bugfix: Synth sent host automation events when opening the GUI. Fixed. Bugfix: Loading an FXP with the GUI closed should now work. Bugfix: Window resize worked incorrectly in some hosts. Bugfix: Suspend/Resume (bypass) should now work. 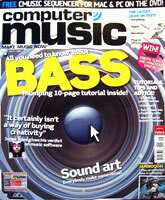 KarmaFX Plugin Pack 1.5 featured in DTM Magazine. 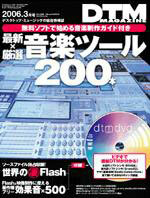 a Japanese monthly magazine for computer-based music production and multimedia technologies. KarmaFX Synth 0.91 in Plugin pack 1.5 has been updated. Note that version number is left unchanged. Bugfix: Crash bug in Cubase SX fixed. Bugfix: Patch save/load should now work in Traction, Podium, and others. Bugfix: Save/load of presets (.fxp files) now works. Bugfix: Possible fix for rare crash when changing filter type (now confirmed). Available in Plugin pack 1.5. Full list of changes to the synth is listed below. KarmaFX Synth Modular 0.91b BETA changes. Changed the name from "KarmaFX Synth" to "KarmaFX Synth Modular". This seems to be what people call it anyway. Added click option to ADSR envelope. On trigger this forces a value reset. Added declick option to Amplifier (to support quick clicky amp envelopes). Changed filters kybd tracking range from [0..1] to [-2..2]. but can be turned off by unchecking "Options->Store Patch in Song". adjustable frequency, resonance/bandwith, gain, modulation, and order. One control id can now be assigned to several knobs. The controllers name is set to the first assigned knob. When controlling more than one knob this is indicated by a plus sign next to the controller's name. change bank as well as patch properties. The 32 assignable controllers are shown in sets of 8 knobs. in the registry and thus only need to be setup once. Added 4 new algorithms to reverb module (adapted from KarmaFX Reverb). Added Midi CC support for patch changes (warning: not tested much). Started SSE optimization of selected tasks. Mainly mixing for now. GUI: Added extra gui gfx to step sequencer to make it easier to understand. GUI: Double clicking on a handle in the step sequencer now resets its offset. GUI: Dragging an env/step handle while holding SHIFT limits movement to x-axis. GUI: All buttons now execute their function on mouse button release instead of press. GUI: Double clicking on the background now brings up the "Add component" submenu. GUI: Right clicking on wire-arrows now removes the wire. (alphabetically) in the same folder. Bugfix: choosing New Patch->Simple Sampler now actually creates a Sampler. Bugifx: Patch names are now stripped to avoid invalid filenames and resulting crashes. Bugfix: Bypassing components in hosts with variable buffer sizes now doesn't result in random noise. Bugfix: Step and Envelope display was updated every frame. Fixed. Bugfix: "Synth FX" was in some hosts wrongly given the "Synth"'s VST id. Fixed. Bugfix: Midi handling fixes. Polyphonic notes don't seem to hang anymore. Bugfix: In some hosts the reset caused by pressing stop/play in the host caused the first note to dissappear. To fix it output has been offset by one sample. Bugfix: Output clip range adjusted. Updated and adapted patches to the new control panel + Added a few new ones. Fixed crashbug when loading in Cubase. Plugin pack 1.4 is now ready for download. Besides improvements to the KarmaFX Synth the plugin pack now also includes the KarmaFX Reverb (Yes, finally!). One of the synths main new features is its new step sequencer (as promised). Full list of changes to the synth is listed below. KarmaFX Synth 0.90b BETA changes. Added step sequencer with adjustable number of steps (1 to 32), individual steptime, offset and slope for each step. Support for tempo change, loop/wrap and snap (when patched into integral controls). Right channel in stereo components could contain uninitialized data. Fixed. Resonance control was flipped for the notch output in SVF Filter. Fixed. Multipoint Envelope did work correctly in polyphonic mode. Fixed. Lfo would sometimes return unitialized data. Fixed. Modulation scale for large range knobs (e.g. the note and octave knobs) was wrong. Fixed. Zipper noise in distortion unit. Fixed. GUI: Added time/position display to multipoint envelope when moving control points. GUI: Modulating Multipoint Envelope controls glitched the env. display. Fixed. GUI: Using menu separators could screw up the patch menu. Fixed. KarmaFX Synth 0.89 BETA changes. curve control for each control point, and adjustable sustain points. "Length" knob in Sampler changed to work as intended, i.e., as the real length of the loop. (Before "Length" controlled the loop's end position). Note, this might change the sound of patches using samplers. Added Position knob to Sampler component (directly sets play position). Minimizing a large component (e.g. the Sampler) now resizes the component on the x-axis also. Recoded equalizer (EQ10) to adapt correctly to high sampling rates. Number of automation controllers was increased to 32 but the host was still led to believe that only 8 were available. Fixed. Filters in Noise and Delay component would update very slowly when tweaking knobs. Fixed. (1) makes it possible to save the current patch into a different bank. (2) work is not accidently lost by changing banks. Synth could crash when loading a sample while playing. Fixed. GUI: Added "Minimize/Maximize All" components to options menu. GUI: When adding a new component, that component is now shown in front. GUI: The sample display in the sampler would sometimes behave strangely,especially with big stereo samples. Fixed. GUI: Left mouse & dragging in the sampler view now scrolls the sample. GUI: Sample position cursor in sampler view would sometimes screw up the sample display. Fixed. Navigation buttons should now always appear in the top of the page. Added User "Feedback" area, where you can post comments to the author and read previous user quotes. Later on I'll be putting user music demos and other cool stuff there too. "About KarmaFX" page added. Still work in progress. Yes, plugin pack 1.3 is out. All plugins in the pack have been updated! KarmaFX Synth 0.88b BETA changes. hardsync and optional ring modulation. Supports saw, square, triangle, ramp and flexible sine. Added 4 extra distortion algorithms to the "Distortion" effect component. Added soft-knee "Compressor" Effect with RMS/Peak gain reduction and optional sidechain. has an antialias button for autoscaling the mod.index. Added "Envelope Follower" Modulator with RMS/Peak detection. an LFO just faster), or in FM mode. It also supports phase modulation. Patch list was not updated in other instances of KarmaFX Synth when saving. Fixed. ADSR envelopes output changed to be in [-1 to 1] range (was [-0.5 to 0.5] previously). Consequently, the initial Modulation Depth for the Amplifier and all Filters has been set to 0.5. Increased number of automation controllers from 8 to 32. Fixed a serious crash bug when loading a new patch after changing voicecount in another patch. Fixed crash bug when patching a polyphonic note pitch controller into another note pitch controller. Recoded the triangle-wave oscillator so it reacts correctly to pulsewith changes. Removed "pulse" waveform from Oscillator1 since it was aliasing badly. The synth now silently ignores patching a component to itself instead of asking the user. Hence, potentially dangerous infinite loop patching is not allowed anymore. clicking on a series of components one at a time. Updated and improved the ADSR envelope. "exp" now behave like a true exponential envelope. Same goes for "log". One can still right click, but this should make it easier to e.g. load a sample. Changed name of "link" led in MidiData component to "midi learn". Changed the patch list popup window to be three rows instead of four + added support for separators. Fixed a bug in the LFO frequency calculation. In large components, knobs would sometimes not update correctly. Fixed. Portamento would sometimes behave strangely in polyphonic mode. Fixed. Fixed rare denormal bug in Amplifier. Improved support for high samplerates (e.g., 48kHz and 96kHz). When saving in sequencer, patch index got lost when using other banks than "Bank 1". Fixed. Some hosts (e.g., cubase) would output noise when changing patch. Fixed. Added a bunch of new patches. Renamed and reordered the existing ones. Better support for 48 and 96 Khz. Suspend now clears delay line. 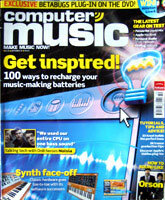 KarmaFX Synth endorsed in the June 2005 edition of Future Music. 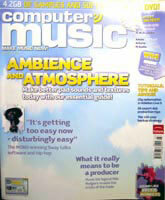 Snippet taken (with permission) from Future Music, June 2005 edition, page 16. 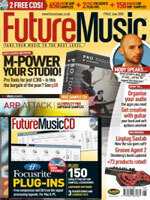 You can subscribe to Future Music here: http://www.futuremusic.co.uk/. The KarmaFX F.A.Q. and the KarmaFX Forum has been added to the webpage. The Forum is meant as a service where users can ask for help, suggest features, share patches, report bugs, or just talk about music making in general. Bugs will also be reported there as soon as they have been confirmed. KarmaFX Synth 0.87 BETA changes. SVF lost sound when turned off and then on, until cutoff was used. Fixed. GUI fix. Sometimes the modulation leds under knobs got lost at random when a patch was loaded. Fixed crash on systems with high latency. Max-latency is still 2048 samples though. A fix for the "tiny window bug" which appeared in Emagic's Logic has been added. Added support for resizing the window. User can choose between small (800x600) or large (1024x768). This is changed instantly in hosts that support dynamic window resizing. Otherwise it is changed the next time the synth is loaded. Setting is saved in the registry. Switching modulation module could cause other modules to freeze in polyphonic mode. Fixed. Poly12, Poly16 and Legato added to notepitch controller. Using multiple notepitch controllers in series or parallel should now work better. Some modules would trigger when initialized. Fixed. "Reverse" function added to sampler's pop-up menu. Retuned filter kybd tracking to be more aggressive. Added "Frequency" controller component. Sweep range is 14 octaves. Enabled knob-snap on knobs with integer ranges (e.g. note and octave). Opening, closing and reopnening the synth could cause a blank vst window in some hosts. Fixed. Added MidiTrig modulator for velocity and note midi-signals. Added MidiData modulator for standard midi controller and pitchbend signals. KarmaFX Synth 0.86 BETA changes. Limited max number of inputs into a component to 10. Before too many inputs caused a crash. Before, opening and closing the synth many times would cause a crash. "Author" and "Description" fields are now saved with each patch. Strange behavior when rewiring a Polyphonic synth was fixed. Improved host update of automation controls. Would sometimes still be active in the host even though they were disabled. Fixed. Ouput component is now undeletable. Before an output-delete would cause a crash. Fixed crash bug when selecting "New Patch". Added infinite loop check when connecting a component to itself. Added experimental mouse wheel support (only works in some hosts). Edited some old and added some new patches. KarmaFX Synth 0.85 BETA changes. Rock solid accurate midi-triggering (<0.85 had glitches). Better band-limiting of classic synth waveforms. Added noise and input generators. Added Comb,Allpass and Shelving filters. Fixed many, many small silly bugs (too many to mention anyway). Hunted and crunched a few more denormal issues. Made skin support (skin is stored in an external dll). Increased max number of patches from 32 to 128.